When a band wants to release music it is a good thing to be completely finished with their songs before entering the studio to record it. 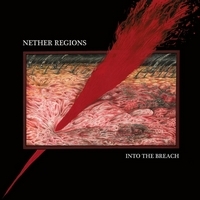 That is not the case for the band Nether Regions who has been around for some years now, and then record 8 songs that are limited to 1,000 copies. That's what they are getting this time, and I'm sorry to say it, but their music is much too unstructured to be taken really seriously. They need a big brush to scrape away all the strange sounds that appear on their debut album, endless guitar fiddling and painful singing is what they offer the listeners, and who can be pleased about that result. Noisy and half-finished, but at least there is one song that has some good attitude, Alpha / Omega, where the talent shows a bit, good idea and well worked songwriting in clean and decent metal that could reach the melting point if it was followed by at least one or two more interesting songs. But if they could work some more and put some juice and power into their songs, Nether Regions could get a name for themselves. Try again, and do better.